This story is the second part in a four-part series about our Halfsy Hero, Carl Samuelson. Our series will follow Carl and three other heroes as they train for the November 6th Good Life Halfsy. A few weeks ago, Carl didn’t finish a race. He made it eight and a half miles with an extremely sore hip before throwing in the towel. Carl said he didn’t want to risk a bigger injury by trying to finish the marathon, but it was a difficult decision. He’d never quit like that before, and he didn’t like it, but he also knew it’s what he needed to do. Carl took a week off of running and then started back up when he felt stronger. He said he’d never had an “out of the blue” injury like that and it felt frustrating to have to stop something that’s now such a big part of his life. But Carl also knows he’s lucky. He’s healthy, he has the ability to run and he’s going to keep running – for himself and for others. 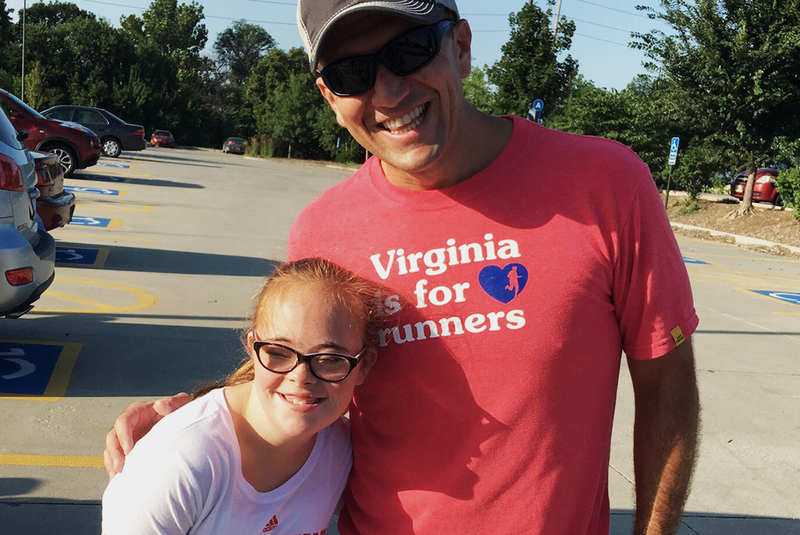 Three years ago Carl joined an online match program called I Run 4 – it’s an organization that pairs runners with individuals who can’t run for a variety of reasons. It motivates runners to think about more than just themselves as they run and train for races. Carl is matched with a girl named Faith who has Down Syndrome. They chat at least once a day via a Facebook group. Carl tells Faith about how his run went that day, how he’s feeling and what kind of races he has coming up. Faith responds with words of encouragement, excitement and the latest news about what’s going on in her own life. They exchange birthday and Christmas cards and Carl sends her a medal from each of the races that he runs. Earlier this year, Faith and her family moved across the country and made an intentional stop in Nebraska on their way to the West Coast. Carl and Faith’s families spent the day at the zoo and the pool, ate pizza and hung out like old friends. With the injury still fresh in his mind, Carl said he’s planning to take it easy on his training as he participates in a few races and then gears up for the Good Life Halfsy. He’s hoping to have a personal best that day and he knows he has the will and encouragement from his friends, family and Faith to make it happen.